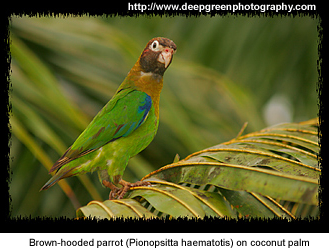 The Brown-hooded Parrots (Pionopsitta haematotis) are native to the Southernmost areas of Gulf of Mexico, Western Panama and Western Ecuador. They favor lowlands and foothill areas up to 1600 m altitude where they can be found in the forest canopy and edges, adjacent semi-open woodland and second growth areas. Their numbers have been declining due to deforestation. The Brown-hooded Parrot averages 8 - 8.4 inches (21 cm) in length and weighs around 165 g.
The adult plumage is generally green, with an olive tone to the breast. The head and neck is brown, darker on the face - especially in males. They have distinctive red ear patches. The wings have blue outer primaries (longest wing feathers) and red linings which show well in flight, and the tail has reddish sides. The eye-ring and bill are pale. The irides (= plural of iris) are red and the feet brownish-grey. Young birds are similar to the adults, but are paler and duller, and without red on the head. Their irides (= plural of iris) are dark. The Brown-hooded Parrots feed in pairs or small flocks of up to 15 birds. Their natural diet consists mainly of various seeds and fruits, including figs, from trees and epiphytes. They can be difficult to see when foraging, as they are slow-moving, usually silent, and is well camouflaged by the forest canopy where they spend most of their time. The flight call is a rolling kereek, and when perched this parrot makes a variety of social gurgles and squeaks. The females lay white eggs in unlined nests - usually a natural cavity in a tree. Distribution: Their range includes eastern Panama, north-western Colombia, east Bolivar. Description: They look like the Brown-hooded Parrots (Pionopsitta haematotis) featured above, but they have red on the upper breast adjacent to grey throat. In some birds the red is also visible on the side of the nape (back of the neck). In males the red feathers form a band, in females they are less developed. Like the nominate species, they average 8 inches (20 - 21 cm) in length.